In the 1000 piece jigsaw puzzle, Games We Played by White Mountain, a collage of vintage board games is depicted. All the old favorites are included in this collage by Lois B. Sutton. 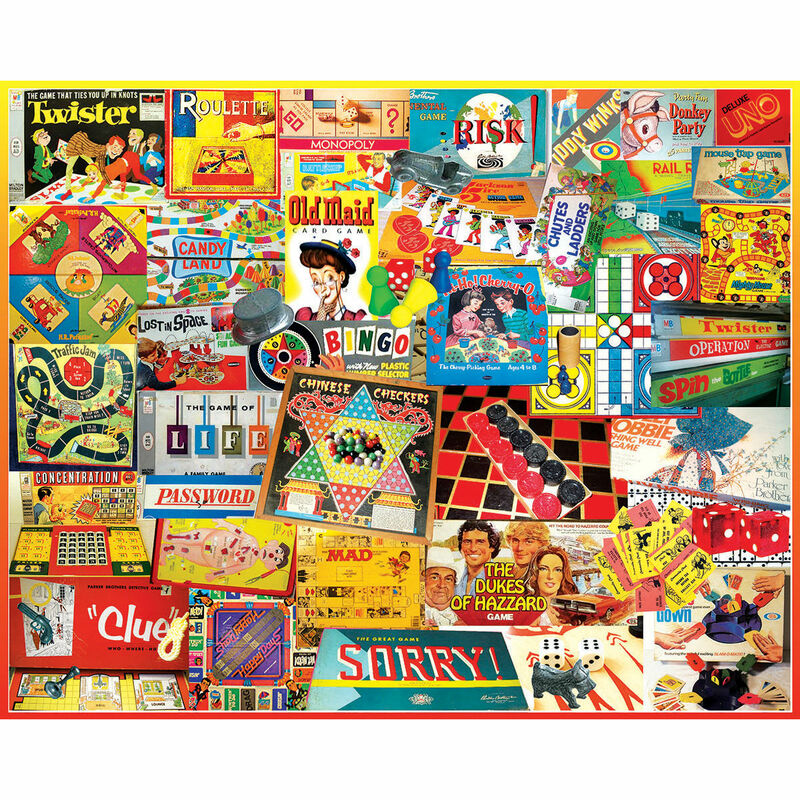 Old Maid, Sorry, Clue, Tiddly Winks, Monopoly, and many more are pictured in this puzzle. So many to choose from - which was YOUR favorite? This puzzle is the perfect afternoon activity to partake in with the whole family! A fun puzzle for anyone growing up playing these games. Highly recommend! Love the bigger pieces. Very familiar with the games on this puzzle which made it a lot of fun! I highly recommend this puzzle! Just a fun puzzle which will also be coated with Puzzle Mod Podge and framed. If you remember these old games, you will truly enjoy putting this puzzle together. As with all White Mountain puzzles, the pieces fit tight making it that much more fun. No loose fitting pieces frustration. Fun and great to work! Wow, what a great walk down memory lane. Very nice, and great challenge. Another good puzzle for young and old to do together. My dad thought this would be a hard one to do, but it was really pretty easy(at least for me). Brought back a lot of memories of some of the games we played while growing up. Love all of the collage puzzles. I have several to do. Just finished this puzzle & it was absolutely great fun to do! Would highly recommend it! fun puzzle! I didn't recognize some of the games but still enjoyed this one. Nice quality and the pieces are a tad bigger than most 1000 piece puzzles but not huge sized like the large piece puzzles. that little bit larger size made it easier to see yet kept the overall puzzle size reaonable. very fun. One of my favorites so far! This was challenging and so much funl. It brough back so many memories (some of the games, I had forgotten about). Great!! I enjoy doing puzzles that I can complete in a short amount of time. Started this one on one day and finished the next day. Thought the big pieces would make the puzzle too easy. WRONG! Great puzzle for anyone who has memories of the 1950's board games. A winner!! It was not only a fun puzzle to do but a nice reminder of some of the games of my youth! Many of which are still around! true classics!! We haven't started this puzzle yet, but it looks like a lot of fun! I hope you make more of these collage-type jigsaw puzzles in 1000 pieces.